With both teams dealing with injuries and fatigue, the first leg of the Western Conference semifinals Sunday featured no goals, unusual rosters, and plenty of fouls. The Sounders’ understudies were all called in at once. Seattle was absent Clint Dempsey due to a red card suspension. Midfielder Victor Rodriguez missed due to injury. Defensive midfielders Gustav Svensson and Osvaldo Alonso both began on the bench. Sounders coach Brian Schmetzer fielded a lineup that had Jordy Delem make his 10th start of the season and Harry Shipp make his 12th. Svensson and Alonso eventually made their way in to the match, but the disruptions kept Seattle from establishing its usual dominance of possession. Vancouver coach Carl Robinson was similarly forced to exclude several marquee players from the starting lineup because his team was playing its third match in seven days. Cristian Techera, Yordy Reyna and Nicolas Mezquida all observed the majority of the game from the bench. Still, Schmetzer felt his side, which finished with a single shot on goal, could have created a better result. “I actually wish we would have pressed the issue a little bit more,” Schmetzer said. “I think there were opportunities in the second half, and even the one opportunity in the first half, where we were able to get behind their defense and create some problems for them. Seattle’s best chance of the night arguably came from a near own-goal, when a cross in from Joevin Jones in the 35th minute deflected off the crossbar after colliding with Vancouver center back Kendall Waston. Defensively, the Sounders were steadfast, limiting Fredy Montero, who scored three goals against his former club during the regular season, to three shots. Svensson and Alonso appeared as substitutes in the final half-hour of play, hinting that the pair had recovered from lingering leg-muscle strains. 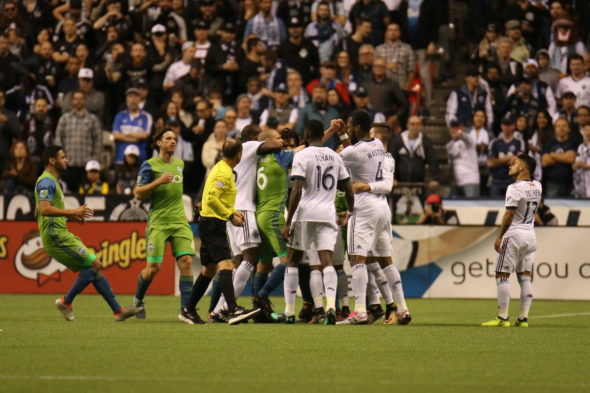 The match had just one major flare-up between the Cascadian rivals. In the 83rd minute, after Seattle left back Nohou Tolo went down with an apparent leg cramp for the second time in a short span, a scrum developed away from the injured player. Despite shoving and grabbing, no cards were handed out by referee Kevin Stott. Cristian Roldan, at the epicenter of the shoving match, chalked up the boil-over to the tension of the series. The draw means that there is everything to play for in the second leg at CenturyLink Field Thursday (7:30 p.m., FS1). A win guarantees Seattle a berth to the conference finals. A scoreless draw in that contest would lead to extra time and potentially penalty kicks, while a draw that features any number of goals would allow Vancouver to advance thanks to the away-goals tiebreaker. With three days to prepare, Schmetzer emphasized the home-field advantage and a chance to field his best players. At least the Caps were held scoreless but I’m surprised the Sounders weren’t more aggressive in the second half. In fact I thought Vancouver had them backpedaling for a lot of the time. Looking forward to a rowdy CLink to carry the Rave Green into the next round. Strategically, the Sounders couldn’t ask for more. Their cagey defense prevented Vancouver from many good looks, and it’s telling the Whitecaps’ best opportunity came from a cross, not a shot. An away goal would’ve been nice, but 0-0 away in first legs are perfectly fine. Aesthetically, there wasn’t much. Nil-nil is better than a first-leg blowout that renders the second leg meaningless (something that should never happen in the playoffs), but there was no urgency to the game. Two-game aggregate is fine for World Cup qualifiers and the like, but not a league postseason.